A lot of people make a lot of money telling others how to become godlier on their own. I call it the "muscle-up" strategy of spiritual growth. They write books that say we all have the ability to make ourselves more like God. Each chapter has a title that tells them where to start. Yeah, if you’re serious about Jesus, it’s time to get in God’s gym and start pumping some spiritual iron, right? These books offer supplements to the Bible; they pick up where the Bible left off. Pick up where the Bible left off? Don’t email me yet, but I hope alarms are sounding as you read that, because these days aren’t unlike the early days in Galatia. People are still stirring up trouble, selling the idea that believers need something more in their life with Christ. They say, "Jesus is a good starting place; but if you’re going to grow, you need to do something extra." Modern semantics have changed the wording a bit; we don’t call it "law" anymore. Instead, we label it with more acceptable names – like "disciplines." If you exercise spiritual disciplines, you’ll grow. Exercising spiritual disciplines helps you produce godliness in your life, right? Please hear me! I am not anti-prayer, anti-fasting, or anti-Scripture reading. Those are all wonderful things if done in freedom by the leading and the power of God’s Spirit. I disagree with the belief that self-disciplines can produce godliness. Only God can produce godliness. This truth is music for the dance! God does the saving. God gives the mercy. His Holy Spirit washes, regenerates, and renews. We need not muscle-up but only trust in what God has already done and allow Him to be our strength today. Father, transformation excites me. It’s an adventure to look back and realize I’m not the same as when I started. Continue to renew my thinking, my priorities, and my love for others and Your Creation. May I learn to rest in Your strength according to what You have already accomplished in me through Jesus. Amen. 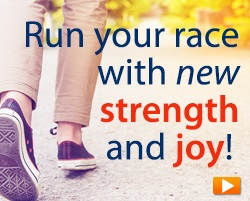 Run your race with new strength and joy! The journey of faith is filled with rocky roads. When life isn't perfect it's easy to confuse the events of life with the absence of God. We want to send you Jill Briscoe’s Faith Enough to Finish book to help you find the strength you need to endure life’s tough times. Request your copy as thanks for your gift today!